I love teaching people how to knit. I love witnessing that moment when you see the confused expression wash away and a big yellow light bulb appear above the newbie's head. Witnessing the moment when a new obsession begins. I liken it to the infamous "forbidden fruit" moment. Scarves aside, once you take your first bite of a project that incorporates some interesting twists and turns (don't forget how increasing/decreasing fascinated you at first), or your first spin "in-the-round", you gain that pesky knowledge of good and evil. The Good: knitting for yourself (freedom from the man aka manufactured clothing, esp. machine knits), expressing yourself creatively through a structurally satisfying art form, and of course having the wonderful world of natural fibers open up to you, among many other things. The Bad: the weight of a new obsession (the constant search for more time in our busy day persists). But we can deal with that can't we? I think we have to. Today I present to you the recent fruits of labor of one such new-knitter who is nothing short of insatiable for his next knitting challenge (he wanted to cut the hat and go straight from garter stitch scarf to full fledged sweater). The momentous first hat. Here we have your basic hat pattern - which I believe is the only way to go when using a yarn that does so much work for you anyway - 2x2 ribbing, stockinette body and spiral decrease crown. The yarn has shown its face around these parts before. This beautiful stuff is from the Tuesday slot of Yarn Portrait Week. I firmly believe in knitting with quality fibers from day one. Beginner or advanced, for what we do here, you owe it to yourself. The colors, as usual deserve a special nod. Knit on 16" circular US 6/4mm needles, this was devoured in just under a week. Maybe it is time for a first-sweater after all. Have you spread the knitting love around to anyone recently? It's refreshing. Infect your friends! Beautiful hat! 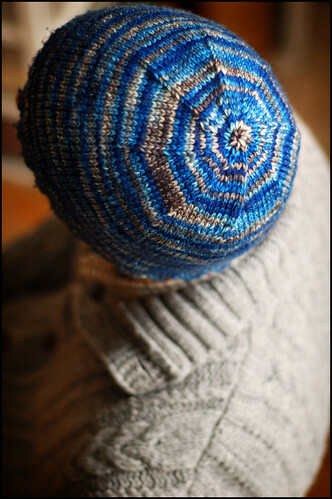 I love the spiral decreases, I think I will do those on the hat I am working on for myself these days. As I read your post, I kept thinking: this is why you use the good stuff! And then you stated the same. Great hat. Unfortunately, no one I know wants to be infected with knitting love. They think I'm a bit bonkers. Wow! 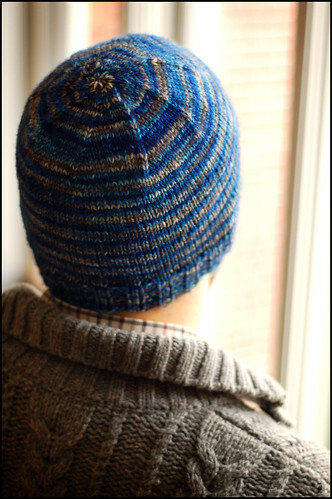 he did a fabulous job on the hat - love those spiral decreases! And you are so right about the yarn. I think this boy definitely needs a sweater! Oh, this is beautiful. The colors make me think of the Mediterranean, or the Caribbean sea... complete with a little sand mixed in. You're a natural teacher, it seems. Always good to see another guy being brought into the fold :) My first knitting project was an acrylic scarf, and I wasn't terribly satisfied with it, so I branched out into a wool beanie, a lot like the one shown. That was when it clicked. Kudos on introducing a new knitter to such lovely yarn! Yes, I recently taught a friend and she made the jump from swatch to sweater. No scarf, no hat nothing. I say, you have to make projects your interested in, even if you are a beginner. Plus, I knew she wouldn't have a problem with the time it takes, so we designed an easy to knit basic sweater. What a great way to spread the love! Give them some of Sundara's goodness and see if they can resist... No chance. He did a great job on the hat! Lucky him he has such a great instructor! :) I went right from a scarf to a sweater - if you have the gusto, I say go for it! Hello lovely hat! I think this knitter's a natural! yep, that yarn certainly does a lot of work all on its own! 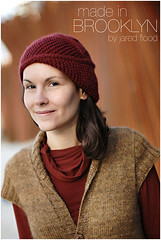 it's really beautiful and paired with the simplicity of the hat, that's a winning combination. I just had two ladies over earlier this afternoon that I am teaching to knit. I bet a hat like this would be really great for them. Love the hat. I find that I have a difficult time using variegated yarn. This is a great example. How funny! Just last night I taught the second of a two-session "Hat-in-the-Round" class at Mabel's. 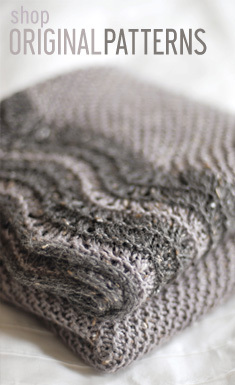 You're exactly right: that moment when new knitters go from fumbling to Ah Ha! is wonderful to witness. Although I like encouraging timid newbies, the ambitious ones (so like myself) are my favorites. Hooray for new converts! Hopefully he'll stick to it and even start his own blog! The last person I converted has surprassed me by far in her yarn obsession. Beautiful hat, it credits the teacher as much as the student. Now you've done it, I am going to have to stalk me some Sundara yarn! Bravo to your friend! He did a great job with some wonderful yarn. Ah, knitting evangelism. I love it! Great job! The colors are fantastic, and I love the spiral decreases! It's really nice to see anyone pass on the knowledge to some one else! There are those selfish types who don't help along new knitters which is a shame to me.....Awesome job on the hat ! ... and it's a nice sweater too!! I recently taught a friend how to knit and she went from hat to endpaper mitts. I was in shock. I think she's still working on them, but she's determined and loving the process! I love this post. I am sending it to my knitting group. Many of them are new knitters/ crocheters so I think they would "get" this. I agree with you about using "quality fibers", but I don't think my group agrees with me, lol. when i was i child my needlework teacher gave up on me. she was a frightful creature. my mother taught me in half an hour instead and we knit together for years. i became a trained knitting and crochet teacher and gave up on it for many years. now i am in the game again. many people say they are too impatient to knit. i personally think it is a virtue when it comes to knitting. then you start and... finish. this new internet based knitting community is a great thing for knitters. never have i felt so inspired and knit such an awful lot of things. i am trying to teach a girl to knit right now. she might as well start out with a raglan boyfriend sweater. Ahh, I actually can't help myself - sometimes I find myself preaching about the good of the knitting like a newborn christian would about jesus. But yeah, teaching to friends who really want to know about knitting is really great! right on Brother! Spreadin the love. If you're not willing to share, you shouldn't leave the house! Your friend did a wonderful job! I think you are right.. bring on the sweater patterns! Fabulous job on that hat! I sure wish I knew you when I was learning! Looks like he is wearing a handknit sweater, yours? And we shall by sticks and strings, one knitter at a time. How rewarding. The hat is fabulous. Great job teacher and student. You should both be very proud. That is beautiful! I love teaching people to knit--an old coworker once joked, "You're on a mission, aren't you, to teach the world to knit?" And you've reminded me that I have three friends chomping at the bit to be taught, and we just need to coordinate our schedules. Here's to teaching the world to knit, one knitter at a time. And that's really your friend's first knitting? The first taste...Do you listen to Fiona Apple? I always look forward to new entries. You definitely get the whole fiber thing! Great yarn, sticks and a sharing soul. You will have to tell your friend that his hat turned out so well that I was forced to de-lurk and share in the admiration of his handywork! The hat looks wonderful! What a terrific first project! Beautiful yarn, beautiful tension, and just a few tiny mistakes in the decreases. (I laughed as I noticed them, because they're only visible for two reasons: his exceptional knitting skill, and your beautiful photos!) I'm a firm believer in starting out with interesting projects -- I usually start people on mittens, and then move them right on over to a good top-down, hooded/cabled/raglan child's sweater. No sense in letting talent like that go to waste! Ciao from Rome! I've been "lurking" for a while too and I am completely enamored of your lovely blog. I just wrote a post about knitting in Rome. Complimenti for being such a great teacher. Totally agree with you on the fibers. I knitted my first full-fledged sweater with *GASP* acrylic. Can you imagine? So sad. I just taught a knitting workshop last night. I titled this one "Beyond the Scarf," and yes, this group of older women could not believe how fancy they were once they learned how to increase and decrease! 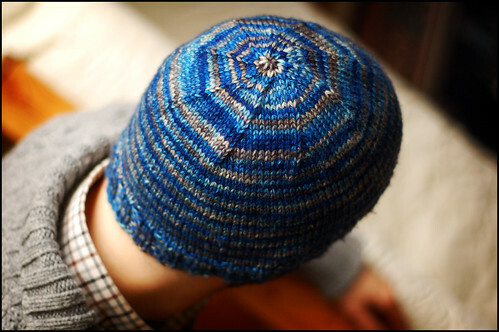 Beautiful -- and this new knitter's hat looks more like a tenth project than a first! I only tried to teach one person to knit, but it turned out she got infected not with an obsession but with an incurable disease. I'd taught myself from a book, and so I thought it would be easier for her to see it live. But it turns out that I'd taught myself to knit reverse direction, left-handed, and continental, and right-handed her got so tangled up in yarn that two years later she is still trying -- and still failing -- to knit in garter stitch. Since then, I've deflected all requests to the nearest yarn store to spare my guilty conscience. I can't resist the temptation to leave my comment. I'm the lucky one, the student who happened to have the greatest and most patient teacher on earth. I've never thought I could or would have the desire to knit in my life, but watching this guy knit and seeing his marvelous finished objects, the astonishing photography, the passion for his website, I decided to give it a try. And there I am...wearing the hat, the first of my life (hopefully not the last). I wanted to fix the tiny mistake in decreasing, but "HE" said that it would be actually funny to look at that flaw in 5 years and laugh at the mistake that I made when I was a begninner (LOL). Thank you all for your appreciation...and especially thanks to Mr. Brooklyntweed! Oh how lucky are you having a great friend that loves knitting as much as you do. Wish I could teach someone to knit ( my 5 yr old learnt last year) so we could sit and knit together. Great hat and the colors are fantastic. I don't know a lot of people who knit and the rest is simply not interested. Although, recently I've heard that the knitting virus is also starting to infect people here, but from personal experience I can only say that most people are not interested in knitting. Other knitters struggle with unwanted attention from strangers when they knit in public, but I never really have this problem, and I knit a lot in trains. Once in a while someone will ask me if what I'm doing is crochet. :D Once it was an old man and once an old lady (very strange that a woman her age would not know how to knit or crochet). Great knitting progeny, dude! VERY nice hat. As for your question at the end... why yes of course, any knitting borg queen would be out there assimilating those poor unknitterly souls into our perfection. A sweater? but of course! Once he learns the allure of choosing yarn and pattern, and the joy of creating larger clothing, he'll never turn back! Um, I'm a chicken knitter. No, I don't knit chickens. I'm just worried about the whole double pointed needle thing. Is this an easy pattern? My best friend taught our entire suite to knit in college, and we all got so obsessed and addicted that one of my friends put a sign in the bathroom that read, "Stop Needing the Needle: Call 1-800-CAST-OFF!" Thanks for creating this beautiful website. "esp. machine knits"........hmmmmm.....you don'r mean home knitting machines, do you? have you seen my blog? I mostly handknit, I crochet, I sew but...I do love my knitting machine for the speed at which I can create something beautiful. Can I say how wonderful your blog is, I love a good natter to read whiclst I am doing a plain row of knitting. Your work is an inpsiration and your photos are fab...I am just diving in deeper for some more interesting stuff to read. What's the yarn you used for the February sweater? It's gorgeous! If you are ever in Sweden, stop by and feel free to help me find my light bulb moment!...After thousands of yards of yarn, I have nothing to show for it...My dream is to learn to make socks this year.